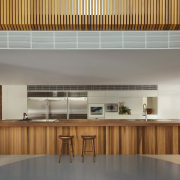 A six-metre long island with a spotted gum waterfall benchtop and cedar-strip front is a star feature in this kitchen by architect Clinton Cole. The galley layout makes it easy for multiple chefs or hungry children to enter the kitchen from either end. Even when the needs of a kitchen are many, a strong, simple layout can be the best solution. Such was the case with this workspace in a new home designed by architect Clinton Cole of CplusC Architectural Workshop. "Given the demands on a busy family with several small children, we decided on an easy-access galley-style kitchen," says Cole. 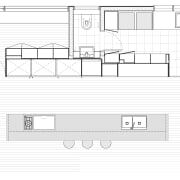 "This layout also worked well with the adjacent double-height circulation and dining space." The islands dramatic waterfall benchtop is in hard-wearing spotted gum. The benchtop is purposely deep to make easy work of prepping and to accommodate the children's activities. 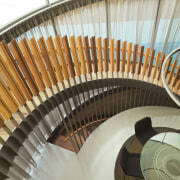 A spiral staircase looks down on the dining table which is adjacent to the kitchen island in this family home. 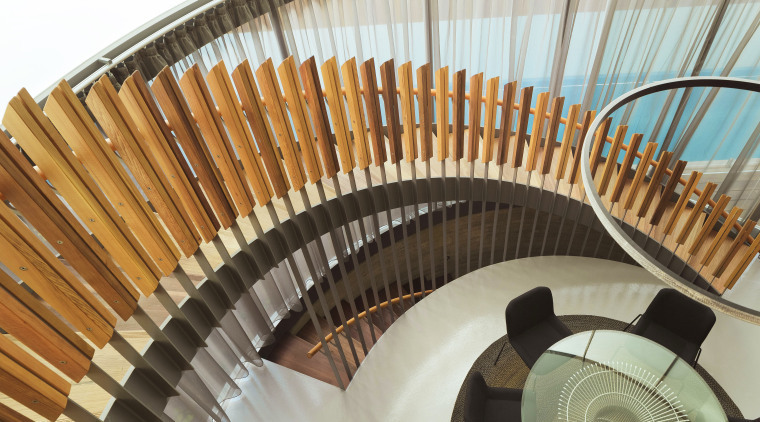 "Spotted gum is a hardwood and we envisaged the entire benchtop could be used as a giant prep surface or chopping block meaning the surface will grow in character over time." The all-purpose island has two dishwashers and storage at the rear. It also includes a high-tech zoneless induction hob and a prep sink. 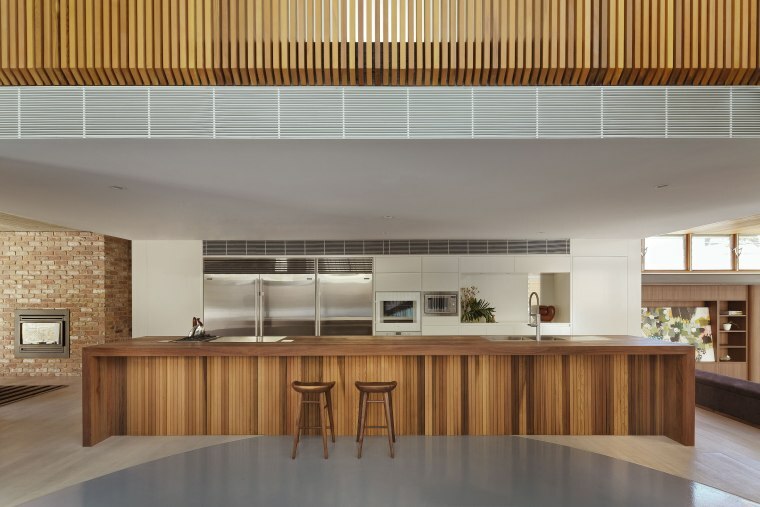 The rear cabinetry is off-white and recedes to the eye, letting the spotted gum benchtop and cedar-strip cladding on the island stand out. The cladding is a little like an abstract artwork with each baton positioned and glued by hand. The largest prepping surface in the world? This islands entire 6m-long hardwood benchtop is intended for use as a chopping board. The high-tech induction cooktop is zone-free, meaning anywhere you put a stainless steel pot on its surface it will spring into action. Alongside is a hob with a high flame option, designed for wok cooking. Two ovens and a microwave are positioned near by on the rear wall. 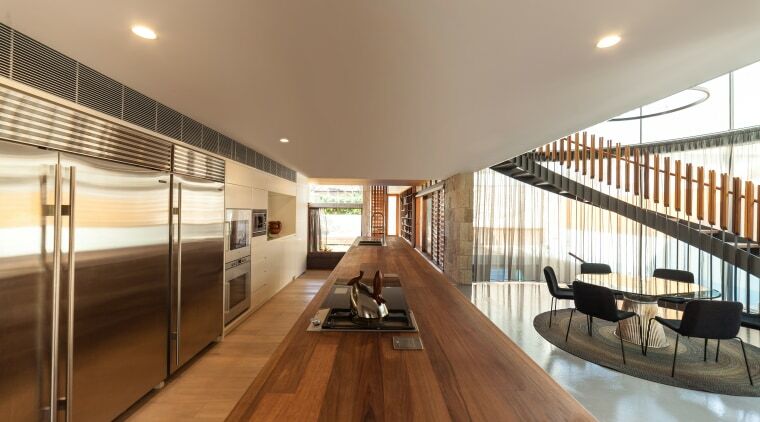 Part of the secret to the large kitchen's clean, sculptural nature is literally hidden in the walls. Concealed doors to the left of the family-size refrigeration units and to the right of the rear coffee station lead respectively to a large walk in pantry at left and a laundry at right. 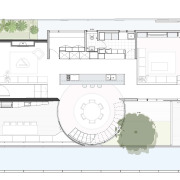 A large round circle of concrete in the wood floor in front of the island delineates the dining area and also leads the eye back to the kitchen. 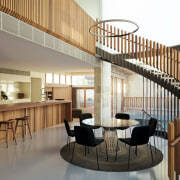 "We also designed the kitchen so there are sight-lines right across the living spaces and out to the courtyards meaning a chef can always keep an eye on the children," Cole says.